The fresh fish selection here is as stunning as the bill you will receive for it, but don’t let that deter you. 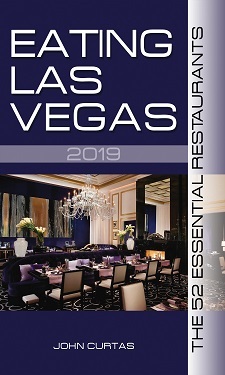 Only one other restaurant in Las Vegas—Bartolotta Ristorante di Mare—even comes close to the freshness and variety offered nightly at this Cosmo mainstay. What is on your plate will cost a pretty penny but that’s only because you’re paying for these Aquarians to taste as fresh as they did when they were lifted from the Mediterranean less than a day before. Everyone starts with the Milos special, a lengthy fried tower of zucchini chips with fried cheese and tzatziki sauce. Equally arresting are Milos’ crudo (raw fish) selection and such standards as a tomato and feta salad, taramosalata, and superb grilled lamb chops. Milos does Greek cuisine proud rather than trying to bury it under mounds of oregano, mint, and mediocrity. If the price of all this delicious authenticity makes you blanch, there’s always the $20.14 lunch special which still packs them in and is the best lunch (and the best lunch deal) in town. 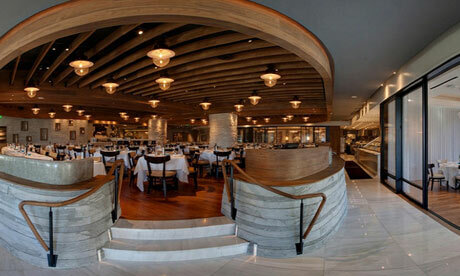 Favorite Dishes: All Fresh Fish; Grilled Octopus; Lavraki (Sea Bass) Crudo With Thyme; Scallop Crudo With Mustard Leaves And Meyer Lemon; Salmon Tartare; Tomato-And-Feta Salad; Lamb Chops; Spit-roasted lamb; Galaktoboureko (Semolina Custard In Filo); Goat’s-Milk Yogurt With Greek Honey. Chefs Tough As Nails? We Don’t Think So. Milos has one of the best lunch deals in town! I had the lavraki lunch deal twice during a 6-day trip in 2012 and just once last December during a 7-day trip. I thought the quality of the fish had decreased noticeably in slightly less than 2 years, though the Greek salad was still one of the best collections of vegetables in Vegas and wine pairing was excellent. My last dinner in my Feb. 2012 trip was at Bartolotta which I found quite disappointing. A fish without a great sauce (Guy Savoy, for example) might as well just stay in the ocean. …Yep. Just like a nice steak without ketchup. A fish without a great sauce might as well just stay in the ocean?!? What? As Alan says, are you someone who puts ketchup on a nice steak?